India is nowhere devoid of history. Think of a place and you will surely get traces of its past. From millennium-old places to age-old arts, one can see the glorious past of India emerging out from every corner of its existence. Kanchipuram is one amongst the major historical towns of India. Situated on the banks of Vegavathi River, it has been an important learning and religious centre in the past and the ancient temples and other architectural arts exhibit its significance. Today, Kanchipuram is extremely famous for its Hindu temples and obviously, Kanchipuram sarees. Also considered as one amongst the seven pilgrimage sites of India, this spiritual town has become the destination for Hindu devotees to get themselves surrounded by spirituality and attain salvation. Kanchipuram is also famous amongst history lovers. For those who tend to walk along the historical lanes and explore its roots buried deep down the layers of time, this beautiful town is a quintessential stoppage. Ruled by Pallavas, Cholas, Vijayanagar Empire and British before independence, Kanchipuram has seen everything ranging from flourished periods to dark times. How about paying a visit to this historical town of temples? If you are on the same page, then read on and get to know all about Kanchipuram. Even though the climate is hot and humid throughout the year, devotees and history lovers come in millions to calm their minds through soulful temples and peaceful corridors of its past. If you are looking to visit Kanchipuram for a spiritual trip, then October until the end of May is the best time as you can enjoy the celebrations of grand festivals, such as Pongal, Chariot Festival, Maha Shivratri, etc. For sightseeing, November to March is the best season. By Road: Situated at a distance of 72 km from Chennai, Kanchipuram is easily accessible by road. You can board a bus directly from Chennai or any other major town or hire a cab from Chennai. By Air: If you are travelling to Chennai by air, then you can take a cab from the airport to Kanchipuram. The Chennai airport is at an approximate distance of 65 km from Kanchipuram. By Rail: There are not many direct trains available between Chennai and Kanchipuram. However, the best way is to take a train from Chennai to Chengalpattu and from there a taxi to Kanchipuram. You can also take the available local train directly to Kanchipuram. However, the best and most comfortable way to reach Kanchipuram from Chennai is to travel by road, irrespective of everything. Take your own car or hire a cab and eventually be on the road to enjoy the en route beauty of hills, small lakes, rich plains, etc. Route 1 is preferable as it takes lesser time in comparison to route 2. While on your way to Kanchipuram, you can stop at the following places and enjoy the best of your trip. The origin of Adyar river, this beautiful lake is serving as a water reservoir and supplies water to many parts of Tamil Nadu. You can take a break here and enjoy the breeze calming your soul and mind. An ancient Shiva temple is also located nearby this lake where you can actually start your spiritual journey. Another lake on your way to Kanchipuram, Sriperumbudur Lake is famous for its brackish water. The natural beauty of this lake may give you chills while savouring the spectacular views created by its presence. A small waterfall is also located nearby this lake where you can relax a bit and enjoy the sense of quietude. You can finally halt at Kanchipuram and savour the beauty of this historical town. Once you have reached Kanchipuram, you can feel the essence of spirituality and devotion all around. It is next to impossible to restrain yourself from wallowing in the space full of composure and collectedness. Following are some of the most popular and visited places in Kanchipuram. 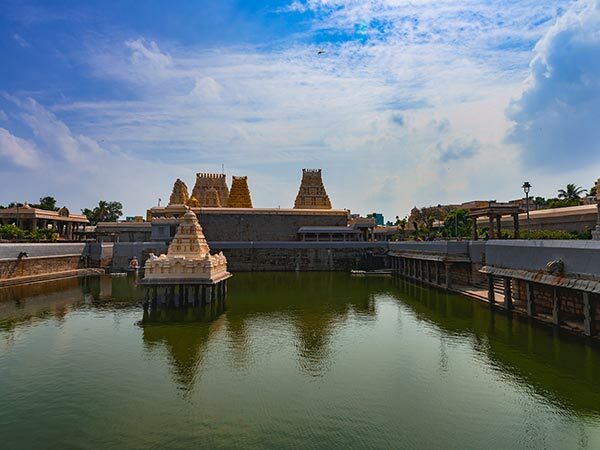 Built by Pallavas kings and dating to the 7th century, this temple is dedicated to Goddess Kamakshi, an incarnation of Parvati, the goddess of power. It is spread over 5 acres with a pond in the centre enhancing the glamour and beauty of the temple. Unforgettable architecture and incredible patterns and designs carved on the temples are certain specialities of Kamakshi Amman Temple. The largest of them all, Ekambaranathar Temple is spread over an area of 20 acres and boasts of its magnificent Shaivite shrine and drawings over the walls. Built by Pallavas and renovated by Cholas, this beautiful and historically significant temple is a major attraction throughout the year. With 58 small Shaivite shrines and an 18-sided Shivalinga, this temple has become the cultural signature of the town. Kailasanathar Temple is the oldest temple in town and is famous for its commendable pieces of art over the railings and walls. If you desire to know about the history of Kanchipuram, then this temple is a must-visit for you. Legends of Hindu mythology come in the frame as soon as you enter this temple. It is small ancient house showcasing the rich heritage and culture of Hinduism and how it changed over a period of time. If you want to discover more about the culture and tradition of Hinduism, then Kanchi Kudil is your destination. Do not miss the chance of getting astonished by the history and heritage. Kanchipuram is the land of temples and it is impossible to visit and scrutinise each and every temple in a day. You can also visit Varadaraja Temple, Devarajaswami Temple, Vaikunda Perumal Temple and find yourself amidst the fragrance of incense sticks, flowers, bells and sense of devotion and spirituality.